"The important thing is to keep that smile on your face, even if you're drowning." John Sayles' films represent an odd enigma to the typical mainstream filmgoer. They contain recognizable faces and appear to offer a straightforward plot structure, but the stories often veer in multiple directions. Such conventional elements as a small group of lead characters, simple story, or perfectly satisfying ending do not inhabit this world. Instead, the tales venture closer to reality and explore the minute emotional details of a larger collection of characters. Sayles provides a more complex inspection of a community and its historical aspects. His films sometimes draw criticism as a "poor man's Altman," but they vary considerably in the overall atmosphere. Sayles' directorial style matches the particular tone of the places visited and does not become self-indulgent. Whether the story depicts the Black Sox Scandal of 1918 (Eight Men Out), struggles in the Alaskan wilderness (Limbo), or a murder mystery in Texas (Lone Star), the intense focus effectively draws us into the society presented. Sunshine State takes us to Plantation Island�a small Florida community facing an influx of large-scale development plans. The monstrous investors make under-the-table deals with City Council members and use scare tactics about rising tax prices to convince landowners to sell their property. Alan King and his group of lazy businessmen play golf and spout philosophy far away from the dirty work occurring on the site. They seem to pull the strings from afar while their underlings deal with the community. Some citizens are obviously upset over the loss of their comfortable surroundings. Dr. Lloyd (Bill Cobbs) angrily tries to stir up his fellow residents against the developers, but many lack his arduous energy. Oddly similar to the 19th-century Gold Rush, prospectors appear from all sides to gobble up the available land by any means necessary. Sayles defies our expectations of a "little guy vs. the big greedy corporation" conflict and uses it as the backdrop for a more personal story. The central plot revolves around two women dealing with their own difficult struggles. Desiree Perry (Angela Bassett) was sent away from Lincoln Beach when she became pregnant at the tender age of fifteen. An aspiring actress, she has resigned herself to infomericals while living with her husband Reggie (James McDaniel) in Boston. Now returning to the island, she must face the troubling issues from long ago and the continual rift with her mother (Mary Alice). Meanwhile, Marly Temple (Edie Falco) has taken over control of a run-down hotel originated by her father Furman (Ralph Waite). Unfortunately, this job differs considerably from her own aspirations, and telling her dad will not be an easy task. Desiree and Marly's stories intermix fluidly with the lives of numerous residents at Lincoln and Delrona Beach, the two main areas of the island. "Flash" Philips (Tom Wright) was once a hometown football star with a good chance to win the Heismann Trophy. Sadly, a devastating injury knocked him out of football and placed his career into a far different venue. Francine Pickney (Mary Steenburgen) presides over the annual Buccaneer Days Festival, which celebrates a "made-up" tradition that never actually took place. She smiles and remains graceful while masking a fierce inner turmoil about the whole event. Sayles masterfully weaves each person's life into a coherent whole and presents a score of compelling characters. The joy of Sunshine State is watching individuals surprise us and choose a different path from the one expected. When architect Jack Meadows (Timothy Hutton) appears as the company's representative, we assume that he will eventually reveal his untrue colors. Instead, he becomes an interesting character with real ideas and tough choices to make. The performances are top-notch across the board, especially from Falco, who sheds any remnants of her Sopranos persona and creates an intriguing figure. Mary Alice also shines as the more-traditional mother to Desiree, and James McDaniel meshes nicely with Bassett's strong presence. There are too many charming intricacies and memorable scenes present to even come close to mentioning them all. John Sayles has once again surpassed our expectations and crafted a fine picture of engaging complexity. Image Transfer Review: Sunshine State includes an impressive 1.85:1 anamorphic widescreen transfer that presents the bright Floridian colors in fine fashion. While the characters stroll along the wide, sandy beaches and pass the engaging landscape, the picture offers a nice sharpness that enhances the shots. Some very minor instances of grain and a few specks do appear on the print, but they fail to distract much from the overall presentation. Audio Transfer Review: This release features a decent 5.0-channel Dolby Digital audio track that brings the small-town atmosphere to life. The dialogue and background sounds are clear and easily understandable, which helps to draw us into the multiple stories. This transfer is not particularly powerful, but this quieter feeling matches the slower feeling of the plot development. The rear speakers are used to create a more complex sound field, which does not match the quality of the premier transfers. However, this audio transfer does effectively convey the story without providing any notable distractions. Extras Review: This release contains only one wortwhile extra, but it is an excellent inclusion. Writer/director/editor John Sayles offers another wonderfully complex feature-length commentary that gives us tremendous insight into the production. Similar to his Limbo discussion, this track includes technical information and statements about individual characters. Sayles speaks in a fairly montonous tone, but his friendly demeanor keeps it from becoming a dry experience. There is significant discussion about the actors and his reasons for using them, and we also learn about several major themes. The commentary features enough interesting material to warrant around 140 minutes of viewing time. 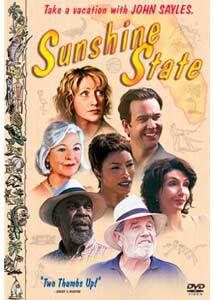 This disc also features the original theatrical trailer for Sunshine State, which appears in the 1.85:1 widescreen format with 5.1-channel audio. Full-frame previews for Limbo, The Secret of Roan Inish, and Passion Fish round out the bonus section. Sunshine State reveals even more layers with each successive viewing. While accompanying his wife to Florida, Reggie becomes a father figure to a troubled young cousin living with Desiree's mother. This story occupies a fairly brief portion of the screen time, but it still resonates strongly due to subtle writing and effective acting. John Sayles consistently draws deeper performances from well-known actors because of the realistic characters involved. I highly recommend that you ignore the lengthy running time and enjoy this remarkable gem from an underappreciated director.